After spending 16 hectic days in Turkey, we feel we experienced almost everything about its food, culture and archeological sites. 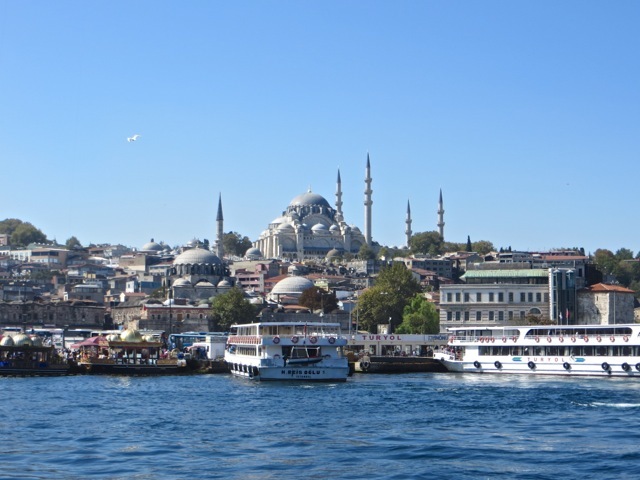 Our tour covered many of the popular tourist sites in Turkey, and we had to be on the road some 4, 5 hours everyday. That is exhausting, especially for us at our age. Turkey is a secular republic while most of its people are Muslims. It does not practice sharia law and has been striving to westernize since the Ottoman Empire collapsed one hundred years ago. In fact, all-covering burqas and long bearded attires are frowned upon by law. 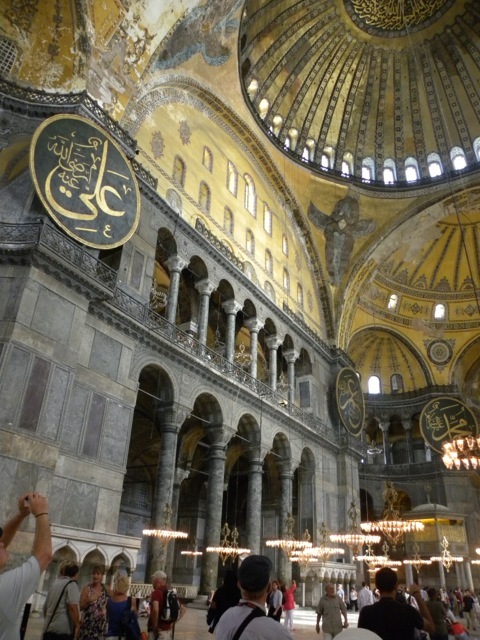 This beautiful Byzantine relic was the largest church for nearly 1,000 years since it was built in the 500s AD. In the last 1,500 year, it was repeatedly damaged by earthquakes. In its last 600 years of existence, it was converted into a mosque, then became a museum in 1935. As a Chinese, I can only marvel that this wondrous building lasted so long since most ancient Chinese monuments have been destroyed. The enormous space enclosed by the building is stunning, especially when this was first built. The ceiling is 180 feet high, almost creating its own microclimate. An 18 story building can fit under its dome. 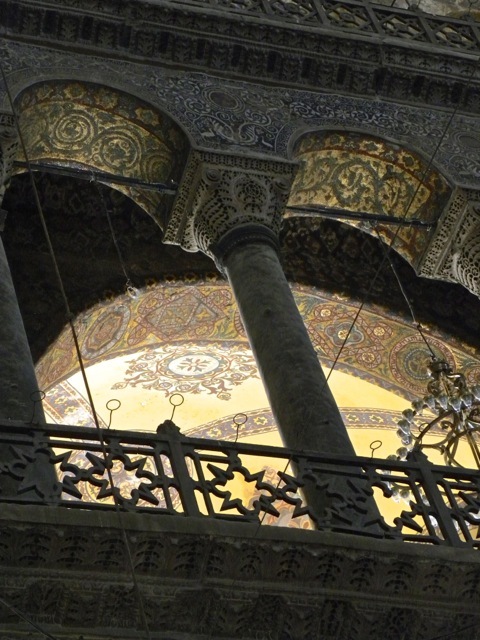 The opulence of the Byzantine Empire is demonstrated by the golden mosaic of Hagia Sophia. The rich coloration and patterns of the mosaic are breathtaking. 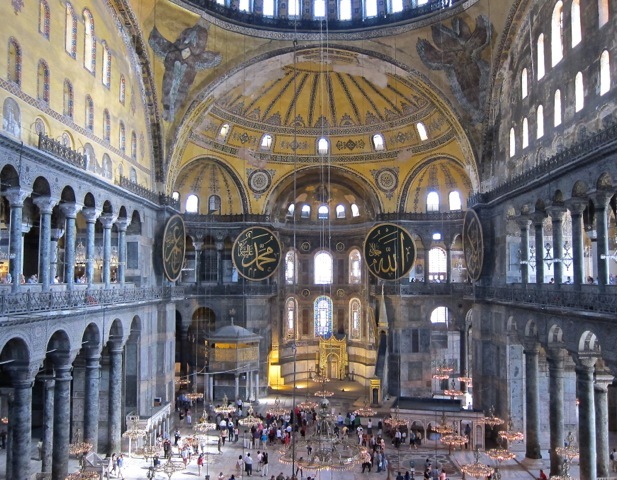 When the Ottoman converted the church into a mosque, they covered most of the icons that featured living figures. 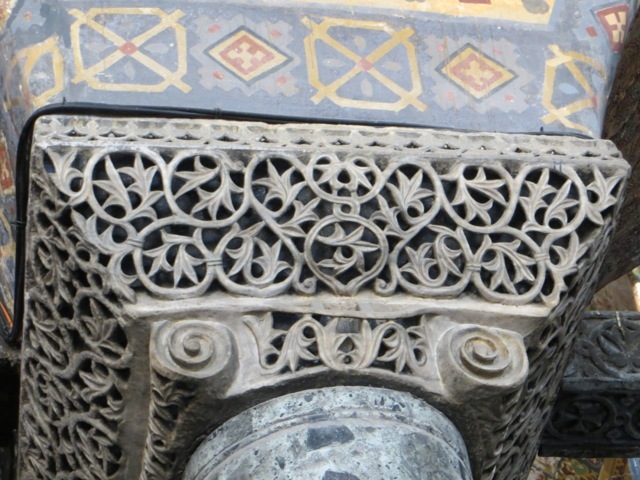 These fish, symbols of Jesus, were uncovered when the mosque was deconsecrated. 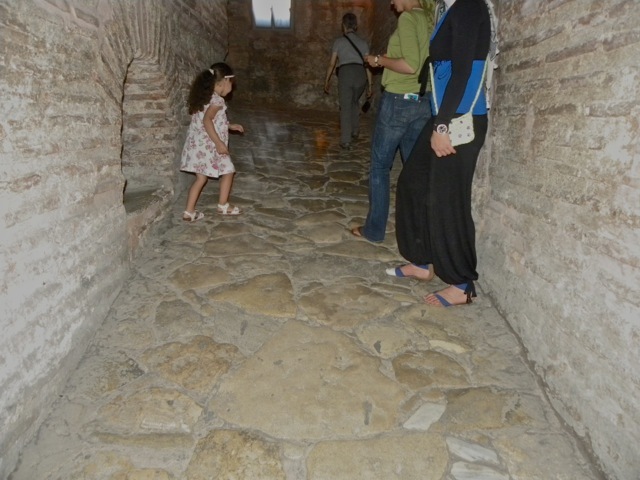 A winding ramp taking us to the upper level is paved with stones. 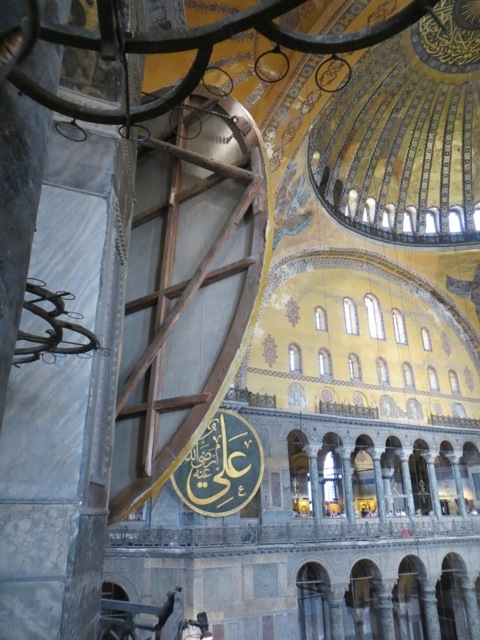 The gigantic panels featuring Arabic writing hung in the Hagia Sophia are supported by wood frames. The capital of this interior column is covered in delicate filigree, retaining a vestige of the ionic scrolls. 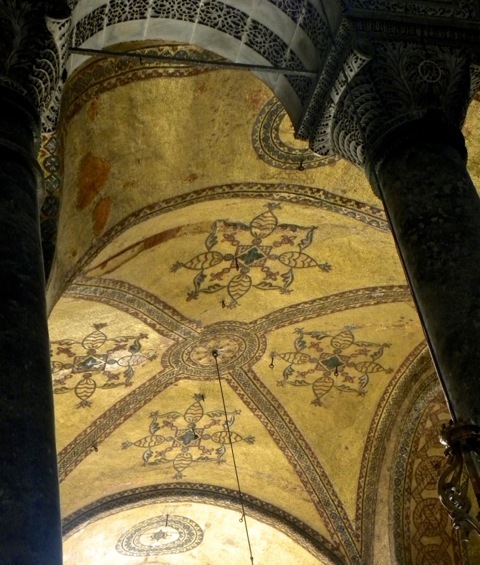 The doge of Venice who ordered the sacking of (Christian) Constantinople by the (Christian) 4th Crusade was buried in the Sophia. That’s hutzpah and demonstrates a lack of foresight. 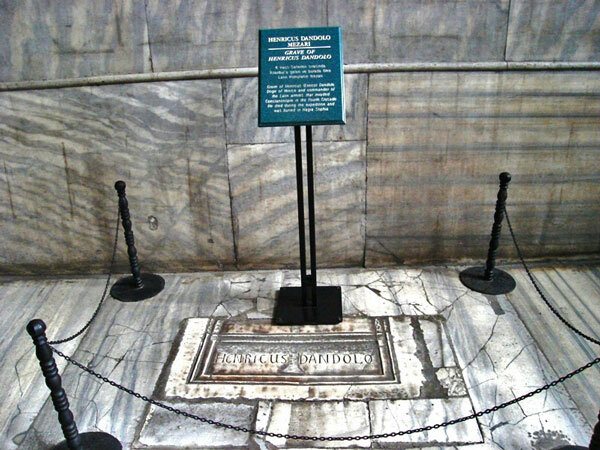 This tomb has been spat on by residents of Constantinople for centuries. Pity the janitor who has to clean it every day. 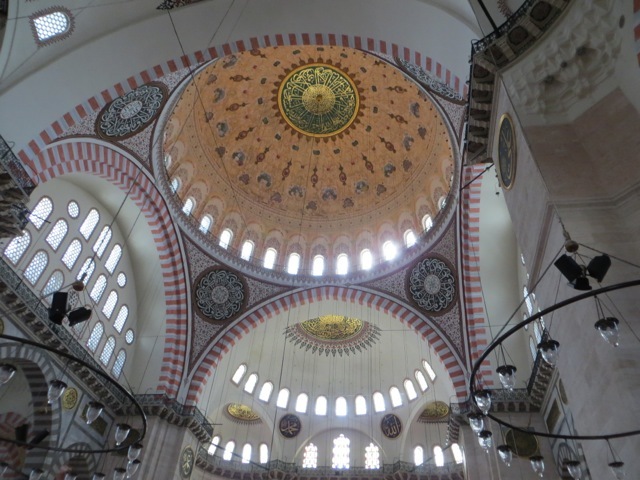 A young Ottoman sultan wanted a big mosque built in his honor. 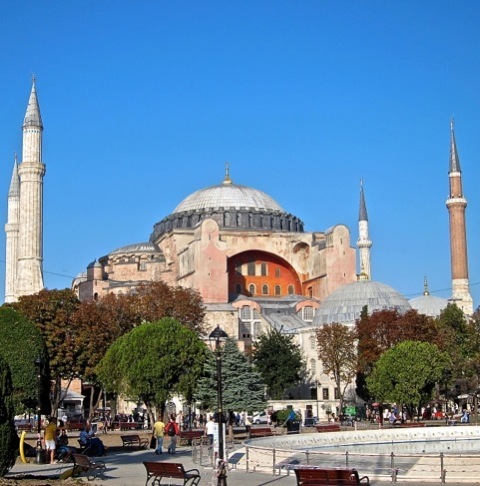 The Blue Mosque was built in 7 years, near the Hagia Sophia. These two mosques broadcast calls to prayer simultaneously, 5 times a day, and bombard pedestrians with competing, stereophonic, penetrating, ringing loudspeaker calls. 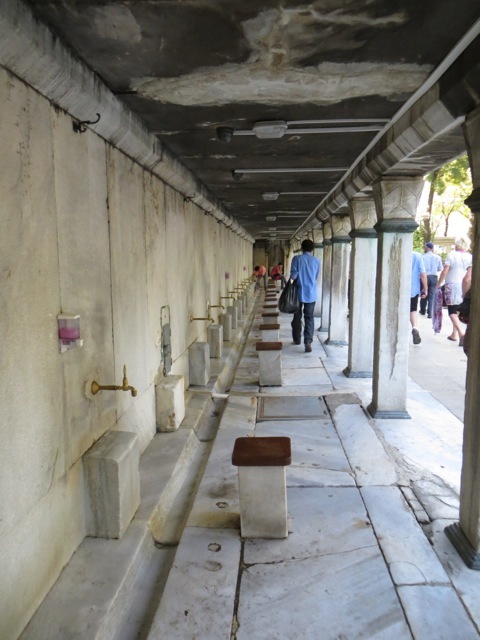 The ablution stations allow the faithful to wash up before their prayers. They sit and put their feet on the marble blocks to wash thoroughly. This is a desirable clean habit especially when people in many other cultures do not bath frequently. 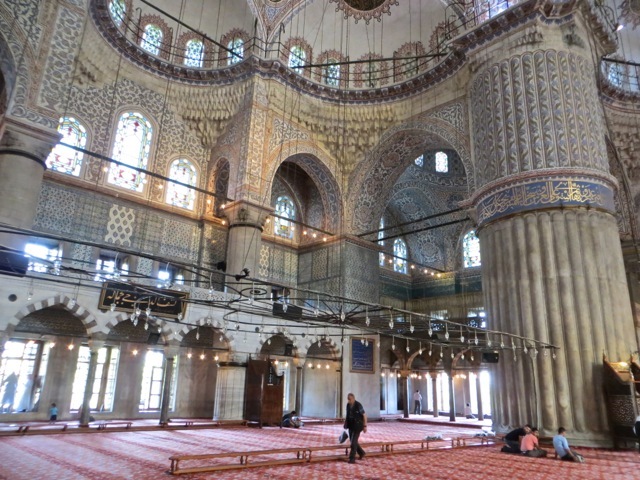 The interior of the Blue Mosque is elegantly covered in subdued patterns. The focus on patterns encouraged the Arabs to study underlying natural orders and became the best mathematicians and astronomers for many centuries. 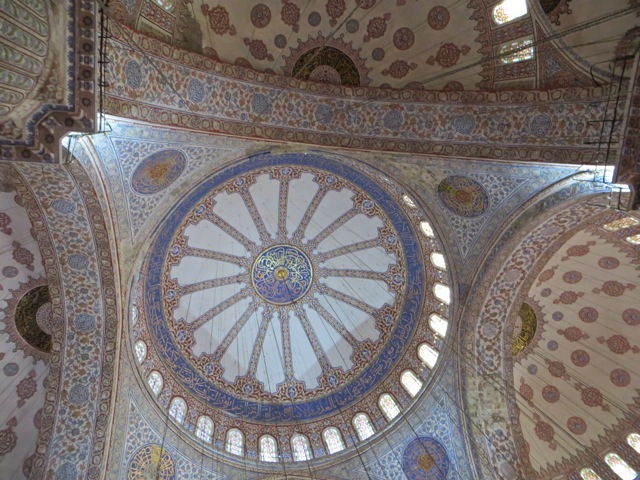 Patterned after the Hagia Sophia, the Blue Mosque was built 1,000 years later than the Sophia, but is just as stunning. 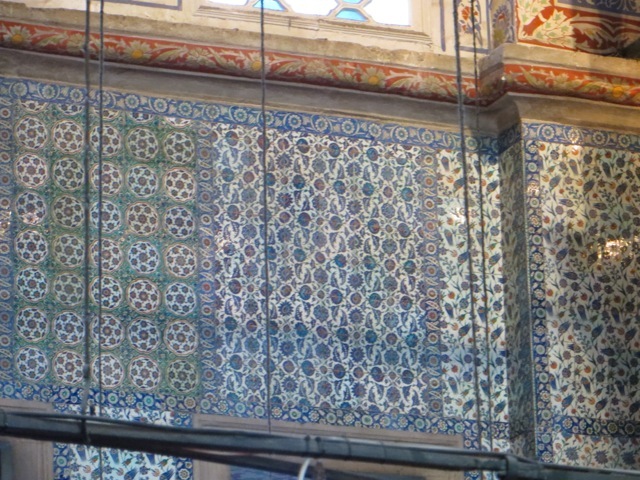 The Blue Mosque is covered by many blue tiles, giving it the commonly known name. But not enough blue tiles were made in 7 years. 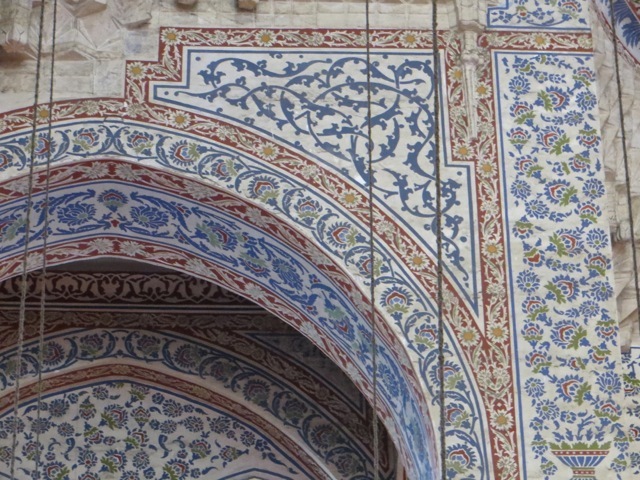 To expedite the opening of the mosque, the sultan ordered the upper surfaces painted in blue motifs. 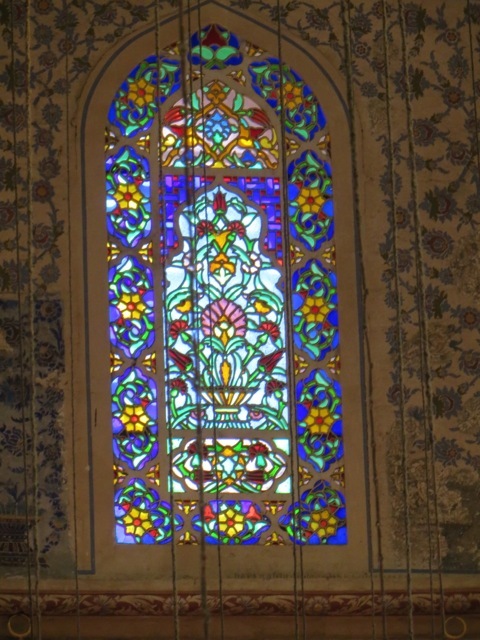 Most mosques have beautiful stained glass windows. 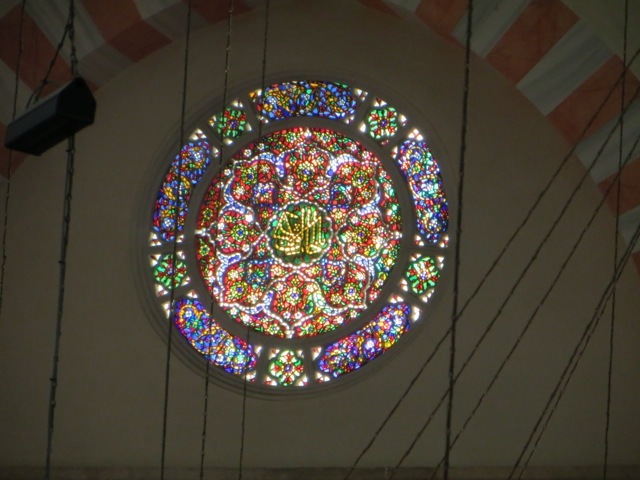 Sally and I like to look at stained glass beauties in cathedrals and mosques. Perched on a hill, this mosque is a landmark dominating the skyline. It is credited as the mosque with the perfect proportions. Seen from a distance, it does convey a solid and graceful feeling. 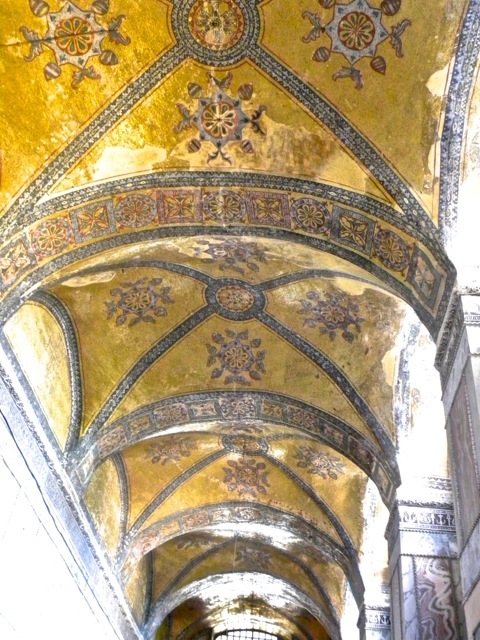 The dome is decorated, but many surfaces are left unpainted. This accentuates the elegance of the relatively sparse patterns. The dash of colors brings in brilliant sun light. 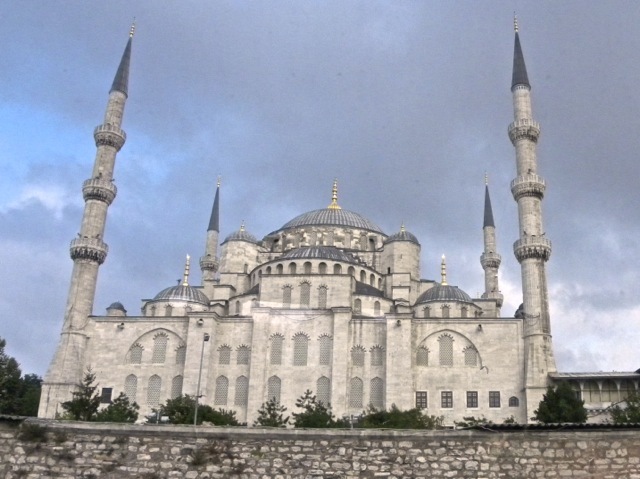 Unlike the Sophia and the Blue Mosque, this mosque had only a few tourists. 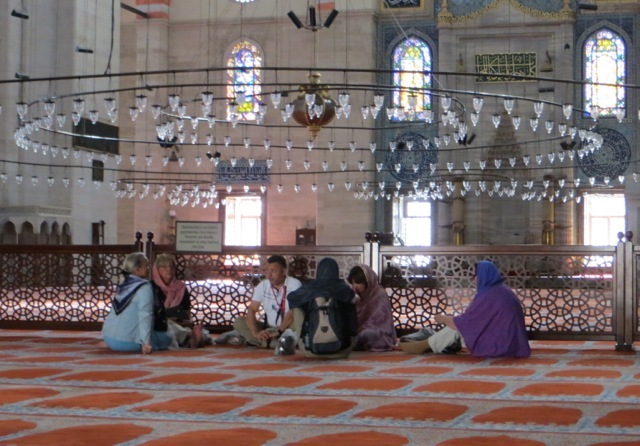 The near empty mosque was inviting for some quiet discussions. This group is apparently a study group, attended by interested women and led by a knowledgeable man. 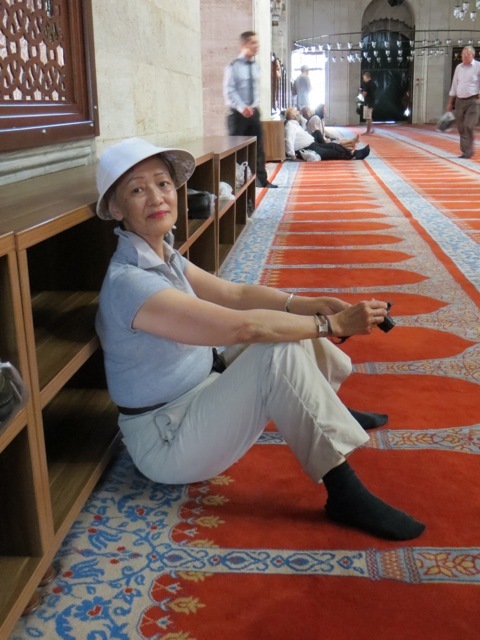 We were attracted by the expansive carpet and sat down by the wall. It was the best time of our Turkey trip. The tranquility was overwhelming, and we stayed silent for 10 minutes. If we were not rushed for time, we could have sat there for an hour. Mosques need constant maintenance. 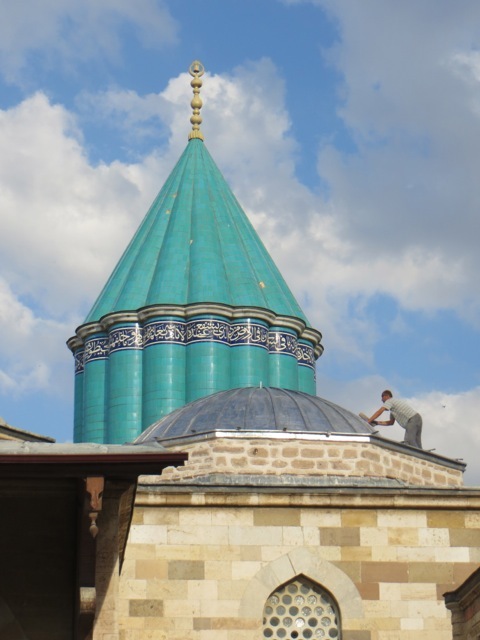 The mosque of the Whirling Dervish founder Rumi needs repair, and this workman pounds the newly laid lead sheets into place with a heavy mallet. Maybe this mosque is of the fundamentalist persuasion. It is covered from head to toe as if wearing a burqa. 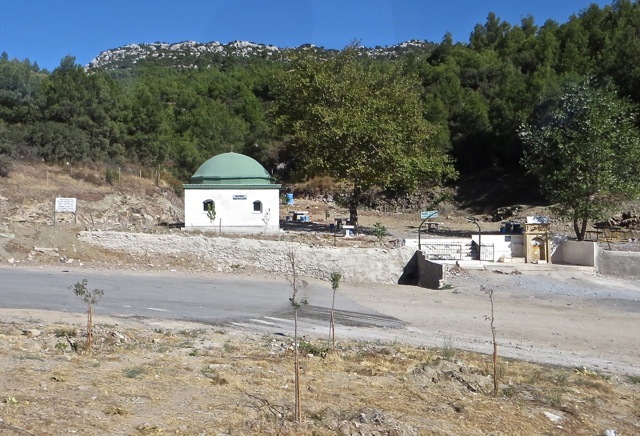 A road side facility offers a fountain for ablution and a room under a dome for prayer. 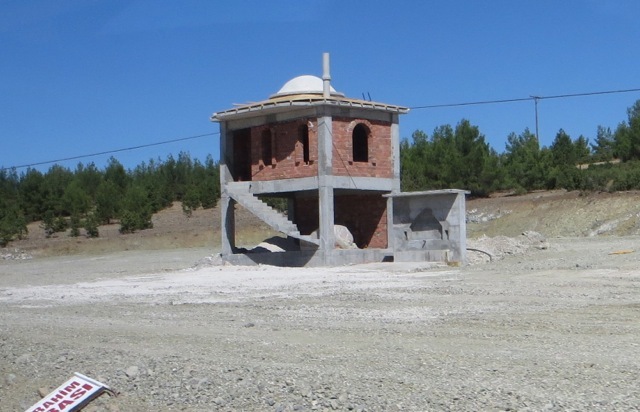 This small prayer building is being built simultaneously with a new highway. 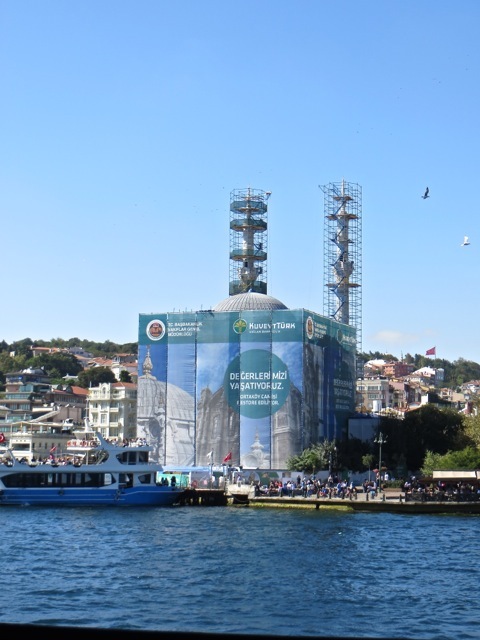 It will have a fountain for ablution, a prayer room under a dome, windows for sun light, a minaret built on top of a base, and a reinforced concrete skeleton to withstand earthquakes. Posted by Robert Wu on Wednesday, October 10, 2012, at 6:51 am. Filed under Uncategorized. Follow any responses to this post with its comments RSS feed. You can post a comment or trackback from your blog.